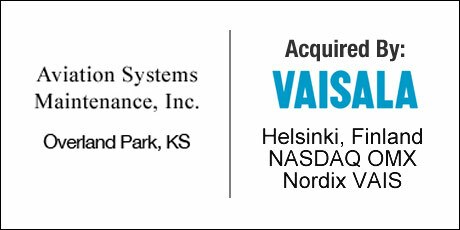 The Buyer: Vaisala is a global leader in environmental and industrial management headquartered in Helsinki, Finland. Vaisala’s corporate strategy included a plan to grow as a service provider. The acquisition of ASMI strengthened Vaisala’s position as a maintenance provider in the US airport weather market, complemented its current contracts and added expertise in the maintenance of additional instruments commonly used at airports. The Seller: Aviation Systems Maintenance, Inc. (ASMI) is an Overland Park, KS based aviation service company with more than twenty-five years of experience in the installation and maintenance of ground-based weather reporting systems and navigational aids. The Close: The DVS Group was engaged to assist this family-owned company in an Exit Planning capacity. Concerns of the tightly regulated industry and a limited buyer pool narrowed their choices to include only highly sophisticated corporate buyers. DVS created a competitive sale environment by approaching multiple parties. The potential buyers included a strategic buyer with a defensive incentive to purchase the business. The sellers obtained a premium price and deal structure for their business and the transaction closed within forty-five days.